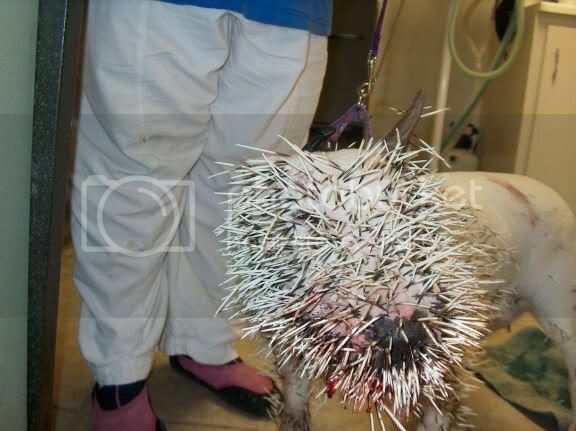 The result of a very brave (more probably, very stupid) dog, who attacked a Porcupine in 2005. The Quill Queen, was most uncomfortable with over 1,300 quills in her front half. She couldnt close her mouth as her tongue was covered with quills. Apparently, there were a lot of quills embedded that were left to work themselves out. I feel for the naked Porcupine. That looks like a 'sticky' situation. 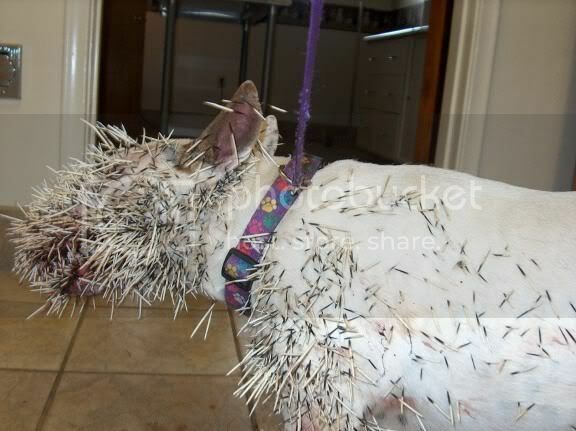 I feel sorry for the puppy dog, but I guess it serves him right for attacking a porcupine. Poor porcupine. It's hard to decide which animal to feel most sorry for actually. there are porcupines living in the arroyos where I live. When walking around my old apartment complex (one hill over) I would occasionally encounter them in my nocturnal jaunts. I would attempt to nonchalantly turn around and walk--quickly--the other way! This is a re-run but worthy of it, and if you haven't seen it, it's new to you! No matter where you go on the internet, Undertoad has been there ahead of you. I used proper grammar and punctuation to make that easier for you to quote in the Hall of Fame and Quote of the Day threads. Aggressive? Yes, pit bulls are commonly quite aggressive and there has been more than one instance when I would have been delighted to leave one looking like this. Besides being a protected species and very NON-aggressive, it is nice to know the porcupine only used 1,300 of its 30,000 quills protecting itself from what appears to have been a sustained attack. Can anyone find an update three years on? I meant porcupines. I was responding to Cloud saying she walks away from them quickly. Pit bulls aren't the same as bull terriers. I'd trust a bull terrier any day over a pit bull. I don't think they are aggressive. But I don't particularly want to find out for sure. I like to be pierced in a more . . . controlled manner. Dammit!! I did search first, but I searched "Porcupine" and only came up with a black dog with a few quills in his muzzle. No biggie, Ducky, did the same thing here. Anyway, that just proves it's an IOtD worthy picture. btw, I really appreciate the help. Last edited by xoxoxoBruce; 05-13-2008 at 10:14 AM. I'm no expert, but in a survival book I've read it commented that porcupines were exceptionally stupid and all it took to 'hunt' them was a large stick. I've had at least one dog and usually two my whole life. I've had a number of different breeds. The two most gentle, family oriented, and generally well behaved animals I've had were both pit bulls. One was a pit bull/lab mix and I'll miss and talk about that dog til the day I die. I lost him to unexplained kidney failure a few years ago. My current dog is a pit bull and possibly the most gentle, docile dog I've ever had. Don't believe the hype on the breed. It is the owner and the training that matters most. On the other hand, you won't find nearly as many news stories about a Golden Retriever that all of a sudden ripped some kid's face off. Don't get me wrong, I've also met many sweet pits. I wouldn't leave one alone with my nieces though. For that matter, I wouldn't leave them alone with a little snippy yappy lap dog with short guy syndrome, either.